From 75 to 95 € the night I book ! 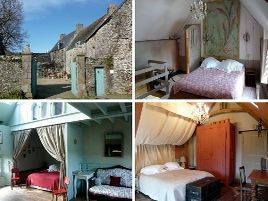 'La Seigneurie', with its strong historical links to Saint-Malo, is situated on the Mont-Saint-Michel bay. The charming rooms with their wood panelling and painted 18th century furniture, are housed in buildings dating from the 16th and 17th century. Private, south-facing garden. The hearty breakfasts are brought to the door of the room or served under the apple trees in fine weather. Friendly welcome from Françoise, an antique specialist..
- Golf des Ormes à 12 km et Golf de Saint-Malo Le Tronchet à 18 km. - Thermes marins de Saint-Malo à 15 km. 3 suites with bath, shower, WC and TV. 75 euros (1 pers. ), from 90 to 130 euros (2 pers.). Extra bed 20 euros. The closest station is Saint-Malo, located at 15 km. The closest airport is Rennes, to 60 km.